Musical aptitude and appreciation persist even as other skills fade. Music can also trigger long-forgotten memories and emotions, easing your loved one’s anxiety and reminding them of the best parts of their lives. Try making a CD of their favorite songs or playing popular music from their youth. Then let your loved one’s reaction to the music guide subsequent selections. Seniors with dementia often enjoy taking objects out of bags. Try creating a memory bag by filling a large bag with items from your loved one’s youth. Because scent is especially adept at triggering memories, consider spraying some objects with a favorite cologne or other fragrance. Images of loved ones can be soothing. They can also help jog a senior’s memory. Try working with your loved one to build a family scrapbook. Then write each person’s name next to their photo. Encourage the senior to decorate the album as they see fit, using glitter, markers, stickers and found objects. Many people find the flora and fauna of a walk in the woods soothing. Seniors with dementia are no exception. Try talking to your loved one about the things you see. Even if they don’t respond or if they seem confused, the simple conversation and gentle natural setting can ease anxiety and help nurture your relationship. Many seniors with dementia still enjoy activities from their youth, such as gardening. Help your loved one create an indoor herb or succulent garden. They may derive immense joy from caring for their plants. Dementia attacks short-term memory first, so for many seniors, old skills and memories persist even as they struggle to form new memories. Try encouraging your loved one to readopt an old skill. For example, if they played piano or danced in their youth, help them try these skills again. Exercise improves your loved one’s health and may help them live longer. It may also slow cognitive decline, improve mental health and help with behaviors such as pacing and restlessness. Coloring uses many of the same faculties as meditation. It encourages mindfulness and focus, which can help ease the anxiety that many people with dementia experience. Start with simple coloring books and encourage the senior to select their own coloring supplies. Puzzles encourage spatial reasoning and problem-solving skills. 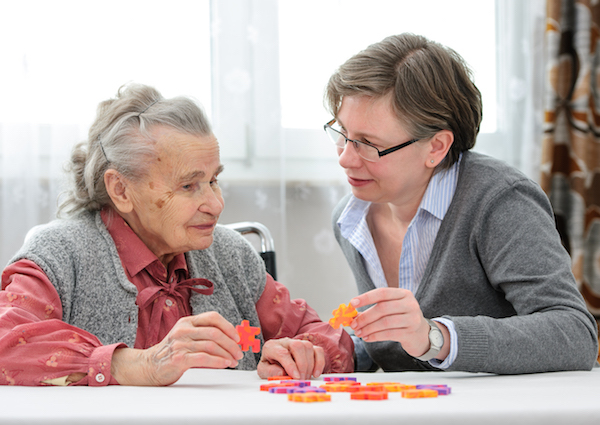 Many seniors with dementia, however, are no longer able to do complex jigsaw puzzles. Try instead offering simpler puzzles, such as children’s 24-piece puzzles. For seniors with advanced stage dementia, simple wood puzzles of just 5-10 pieces can prove both engaging and challenging. Seniors with moderate to severe dementia often get immense comfort from dolls. These dolls may remind them of their time as parents or provide a safe and constant companion. Show the senior how to use the doll — and use a realistic doll, but not one that makes noises or talks. Stuffed animals are also beneficial for some seniors. Call the doll a baby, not a doll, and allow the senior to name the doll. Much like younger people, seniors’ attitudes toward dolls vary. Caregivers should follow the senior’s lead. Seniors who like dolls may also enjoy bassinets, doll clothes and bottles. Those who aren’t interested in dolls shouldn’t feel forced into using them. Arbor offers a wide range of activities and events to keep seniors with dementia engaged, socially connected and active. From yoga classes to community socials, we never stop working to ensure your loved one has an excellent life. We also offer Sagely technology, which allows loved ones to see real-time updates about how their senior is spending their time. We would love to help connect you to the perfect senior living community for your loved one. Give us a call or attend one of our many events to learn more!